A strawberry is a popular fruit-bearing plant, and includes any of the species and hybrid that belong to the taxonomic genus Fragaria. 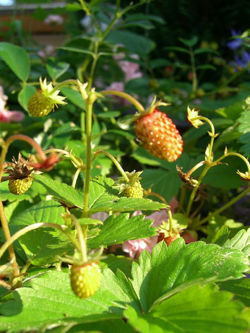 The most common grown strawberry is the garden strawberry (Fragaria x ananassa) . They can be found virtually everywhere, except Africa, New Zealand, and Australia . Strawberries have five basic anatomic structures; leaf, root system, crown, stolon, and daughter strawberry plant. The leaves and roots facilitate the growth and reproduction of the plant. 70% of the roots are under the soil, making the plant susceptible to drought. The crown is where the strawberry plants produce both stolons and flowering fruit stalks that eventually grow fruit (strawberries). Strawberries are not real fruit. They are called aggregate fruits, meaning that the strawberry formed through many ovaries ripening. The seeds on the outside of the fruit are called achenes, this is where individual fruits are contained in their separate ovaries. The many seeds make the strawberry a complex fruit . Initially strawberries grew best in colder regions than in the warmer, southern regions. Strawberries need good irrigation and will die if left without water. They are able to adapt well to a broader range of climates than most other fruits. Strawberries are so delicate and root fast, they cannot be machine-harvested and are usually picked by hand. Strawberries do not ripen after they are picked so it is best to wait until they are fully ripened . Birds help in the distribution of seeds that help many wild strawberry plants grow. When the birds eat ripe strawberries, the seeds pass through them in rather good condition, the the seeds are excreted and fall into the soil . Many different kinds of butterflies and moths feed on strawberry plants . The disease is caused by a fungus living in the soil. The fungus that causes red stele root rot is Phytophthora fragariae,and can remain alive for at least thirteen years ,or more, even if the are new crops. Mycosphaerella fragariae is the fungus that causes this disease. The strawberry gets multiple reddish-purple pots all over the strawberry plant. The pots can be 1/8 to 1/4 of an inch long and a white or gray spot can appear in the middle of the spots . The fungus that causes leaf blight is called Dendrophoma obscurans, and it usually appears after harvest. First the spots start with a reddish-purple color. As they grow, they develop a dark brown center and is surrounded by a lighter brown-purplish border. This fungus usually attacks weaker, slow-growing plants . The fungus that causes leaf scorch is called Diplocarpon earliana. It attacks the strawberry plant’s leaves, calyxes, petioles, runners, and pedicels.When it starts it will look like leaf spot, but will stay dark purple. If the leaf is severely infected it will shrivel and appear scorched . The disease is caused by the fungus called Botrytis cinerea. The fungus causes infections that looked like soft, rapidly-growing spots that are light brown. A powdery layer of fungus spores cover the dead fruit giving it the gray appearance . The cause of this disease is currently unknown. It only affect only flowers and leaves, occurring in the spring. The plant dies two to three years later . This is caused by a fungus called Verticillium alboatrum. Once established it will life for more than 25 years. The fungus that causes crown rot is called Phytophthora cactorum. Usually the fungus causes brown areas on green strawberries. The infected strawberries will have a horrible odor and bitter taste. Strawberries were used in the 13th century by the French as a medical herb . 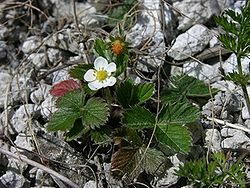 The Alpine Strawberry, Fragaria Vesca, was used as a digestive aid and skin tonic. The fruit helped diarrhea, and the leaves and roots were supposed to relieve gout. The fruit was used to help with the pain of sunburn and to relieve blemishes by rubbing it on the skin. The juice of the strawberry was used to brighten discolored teeth . The ancient Romans believed strawberries relieved melancholy and helped with bad breath. They also thought strawberries could cure inflammations, fevers, throat infections, kidney stones, gout, fainting spells, and diseases of the blood, liver, and spleen . Fragaria U.S. Department of Agriculture,plants.usda.gov, accessed April 21,2011. Plant Anatomy 101: Strawberries author unknown,greenforkutah.blogspot.com, accessed date October 2, 2008. Vegetarians in Paradiseauthor unknown, vegparadise.com, accessed date May 5, 2011. Strawberry Plant author unknown, strawberryplants.org, accessed date May 5, 2011. Fragaria unknown author, wikipedia.org, accessed date May 5, 2011. This page was last modified on 8 February 2017, at 13:49.